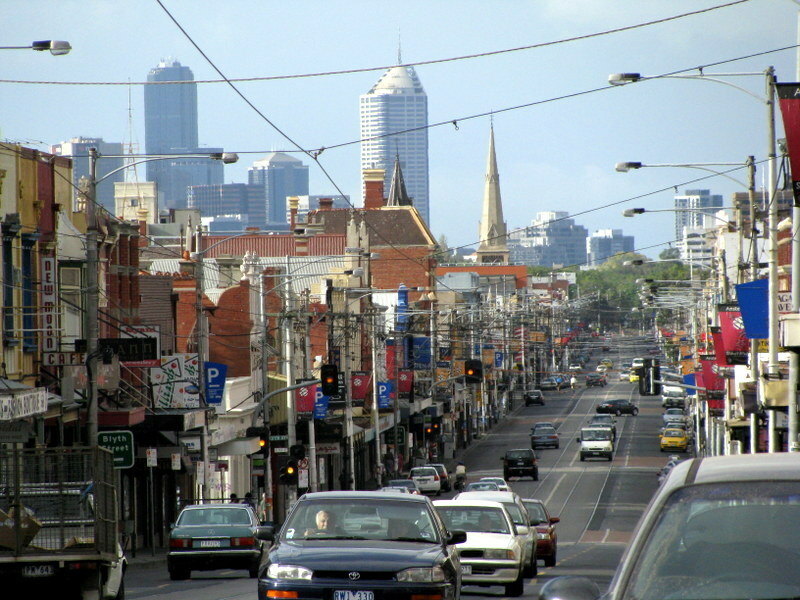 In Melbourne, Brunswick is the home of Middle Eastern food, with numerous Lebanese and Turkish restaurants lining the northern end of Sydney Road. Along with Persian sweet shops, the emerging Shisha ( hookah) bars as well as some notorious Middle Eastern bread shops and grocery stores, a visit to Sydney Road, Brunswick is an exciting and inexpensive trip to another world. I can highly recommend a tram ride on Route number 19 to North Coburg, via Lebanon,Turkey and Iran. I have been cooking food from this region for many years. The salads are vibrant and fresh with herbs used in abundance. The little mezze or starters make wonderful lunches, and the colourful and earthy dips made from fresh vegetables and pulses are so quick to throw together. It is also naturally vegetarian, apart from kebabs, with so much to choose from. Today, as part of this month’s ‘The Cookbook Guru’s ‘ focus on Claudia Roden’s ‘The New Middle Eastern Cookbook,’ I am heading straight to Turkey. This little side dish, Kisir, is simple to make and would be an exciting foil to many other Mezze. The recipe comes from Claudia’s ‘Arabesque’ as I was unable to obtain the original classic, but I am sure some recipes remain the same. 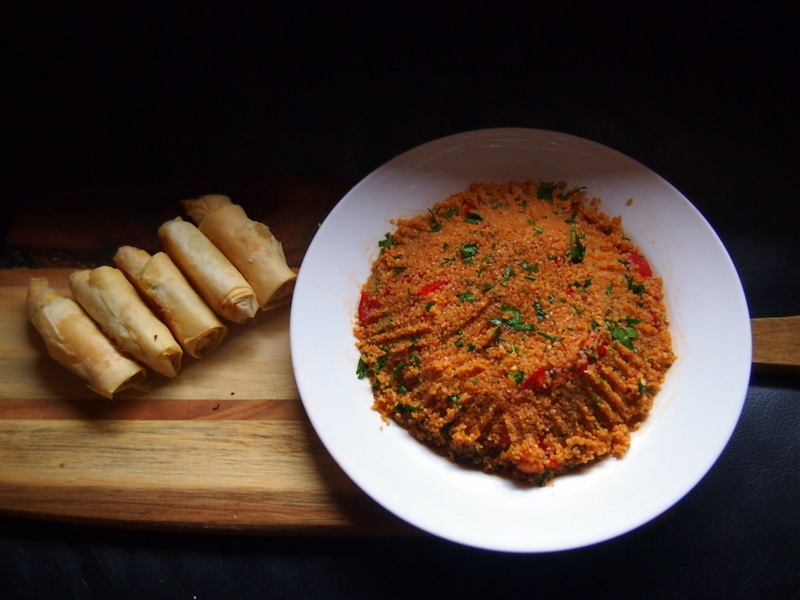 Put the bulgur into a bowl, pour the boiling water over it, stir and leave for 15- 20 minutes until the grain is tender. Don’t be tempted to add more water since the juice from the lemons and tomatoes will soften it further. Add the tomato paste, juice, and oil, the chilli, salt and mix thoroughly. Trim the green tops of the spring onions, then slice them finely. 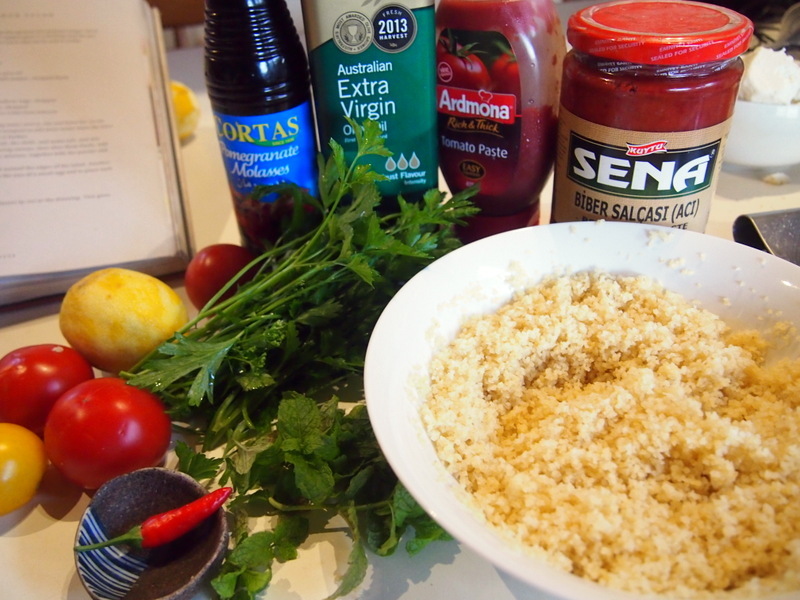 Add them and the diced tomatoes to the bulgur mix, together with the parsley and mint. Serve with the small lettuce around the edge of the salad. Another way is to roll the bulgur mixture into balls the size of a small egg and to place one in the hollow of a baby lettuce leaf. Variation. Add 1- 2 tablespoons of pomegranate molasses to the dressing. I had to add more boiling water in step one. Despite Claudia’s warning, I found this to be necessary. I used the pomegranate molasses and enjoyed this extra dimension. I notice that Ottolenghi also has this recipe in ‘Plenty’. Claudia’s version of this classic is so delightfully simple. Below- Sydney Road, Melbourne 3056. Catch a tram or walk, it’s always stimulating. Another beautifully exotic contribution from Almost Italian…. time to get in the kitchen and break out the cous cous! I love kisir, but admit that I like it with lots of aromatic herbs. Like many of Roden’s recipes, they are traditional and appear in any number of other cookbooks. She usually presents them in their basic form – much appreciated because it gives you something to work with and experiment. Try the kisir in small dollops on little crisp lettuce leaves as an appetiser. Yes, her photo presents it that way, and I guess it would be handy to eat it this way as part of a mezze platter. We’re so lucky to be able to visit these other cuisines so easily and never have to leave Australia. Looks delicious! Yes, we really are fortunate. Love the streetscape Francesca! Ottolenghi recipes are awesome! Good old Ottolenghi, although sometimes he adds just a few too may ingredients. I’m just starting to explore more Middle Eastern recipes – largely through Claudia Roden and especially Yotam Ottolenghi. With lots of parsley in the garden, and the mint starting to grow again, I’ll be trying your recipe soon – sounds really good! Also try Ottolenghi’s parsley salad, from Jerusalem. It has home marinated fetta in it and it is fabulously tasty. Hi Francesca, I just checked it out and it does sound tasty. I will add it to my list of things to make. If you have these herbs growing, you can make so many good things. On our recent trip to Melbourne my sister took us to Balha’s Pastry in Brunswick and also to the Sydney Road Festival. Definitely a place marked for more visits. Balha pastry is a fab middle eastern shop. I like the way they sell the little cakes by the kilo for $22.00. Yum. And the Sydney road Street party is an annual event, preceding the Brunswick Music Festival. I am glad you enjoyed them and hope you get back for more. Aren’t we lucky to have wonderful areas such as Brunswick, Footscray and Dandenong. Visiting is a little like a trip OS without having to buy an airline ticket, and no quarantine of food souvenirs. True, and Victoria Street ,Richmond, Springvale and Preston- thought I might throw in a few more. So much treasure and good food. I love Sydney Road and how it’s character has changed over the years with the different immigrant groups who move into the area. It’s a treasure trove of goodies at great prices. Yes, layers of character in Sydney road. Sadly, it is getting so expensive now, I wonder if treasure can remain.